Leading Manufacturer of led headlamp, explosion proof led headlamp, flameproof led headlamp and led headlamp atex approved from Roorkee. This non-rechargeable dual-function headlamp is cETLus, ATEX, INMETRO and IECEx listed Intrinsically Safe. 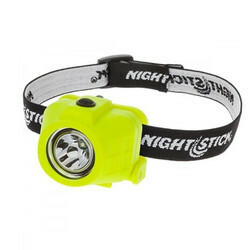 This headlamp features a multi-position tilt head design and includes an elastic head strap with a non-slip lining and a heavy-duty rubber head strap for use on a hard hat. The top mounted switch provides user selectable high or low brightness spotlight operation. Power comes from 3 AAA premium batteries (included). XPP-5456G Intrinsically Safe Permissible Multi-Function Dual-Light™ Headlamp. This non-rechargeable Dual-Light™ Multi-function Headlamp is cETLus, ATEX, IECEx and MSHA listed Intrinsically Safe Permissible. The headlamp features a multi-position tilt head design, a rear-mounted battery compartment and includes both an elastic head strap with a non-slip lining and a heavy-duty rubber strap for use with hard hats. The top mounted dual switches provide spotlight, full-power white floodlight, half-power white floodlight and red floodlight operation. Power comes from 3 AA premium batteries (included). XPP-5452G Intrinsically Safe Dual-Function Headlamp This non-rechargeable dual-function headlamp is cETLus, ATEX and IECEx listed Intrinsically Safe. This headlamp features a multi-position tilt head design and includes an elastic head strap with a non-slip lining and a heavy-duty rubber head strap for use on a hard hat. The top mounted switch provides user selectable high or low brightness spotlight operation. Power comes from 3 AAA premium batteries (included). XPP-5450G Intrinsically Safe Dual-Function Headlamp This non-rechargeable dual-function headlamp is cETLus, ATEX, INMETRO and IECEx listed Intrinsically Safe. This headlamp features a multi-position tilt head design and includes an elastic head strap with a non-slip lining and a heavy-duty rubber head strap for use on a hard hat. The top mounted switch provides user selectable high or low brightness spotlight operation. Power comes from 3 AAA premium batteries (included).